Dr. Miller was raised right here in Houston. He graduated from Texas A&M University with a Bachelors degree in Animal Science in 1981. He then worked several jobs (including delivering dog food) before returning to Texas A&M University where he received his Doctor of Veterinary Medicine in 1991. He worked in South Texas before returning home to join Dr. Davis at Village Veterinary Clinic in 1994. Dr. Miller has helped Village Veterinary Clinic grow into the successful clinic it is today. He treats every pet as he would his own. This has made him the favorite of many clients. He is very active in the veterinary community, serving as president of the Harris County Veterinary Medical Association and most recently, the Texas Veterinary Medical Association. Dr. Miller and his wife, Jane, are hoping to start enjoying their new quiet life together now that their two children are off at college. Dr. Seth Landry earned his Doctor of Veterinary Medicine from Texas A&M University in 2006 and joined the Village Veterinary Clinic team in 2010. He has a strong interest in preventative medicine, sport medicine, and surgery. Born and raised here in Houston his childhood dream was to become a veterinarian and now has the pleasure of living and serving the community he grew up in. Dr. Landry actively serves the veterinary community as a member of the Harris County Veterinary Medical Association (HCVMA) serving as the president in 2013. He also is a member of the Texas Veterinary Medical Association (TVMA) and American Veterinary Medical Association (AVMA). His high school sweetheart (Shelley) and he married in 2001 and now have three human kids (Shelby, Wyatt, & Walker) and one hairy kid (Trudy the Deutsch Drahthaar). Dr. Davis was raised in Marked Tree, Arkansas. He graduated from the University of Arkansas in 1958. He received his Doctor of Veterinary Medicine from Oklahoma State University in 1965. He and his wife, Mary Catherine, moved to Houston in 1965 where he started working at Village Veterinary Clinic as an associate veterinarian. He soon became an owner of the clinic he loved. Although Dr. Davis is no longer with us, he will be in our hearts and part of Village Veterinary Clinic forever. Dr. Walsh was raised in Houston. She always wanted to be a veterinarian and practiced on her pecking duck named Pietri. She received her Bachelors from Rice University in 2008 and her Doctor of Veterinary Medicine from Texas A&M in 2013. She joined Village Veterinary Clinic shortly thereafter. She is interested in small and exotic medicine, soft tissue surgery, dermatology, behavior and sports medicine. Rachel and her husband, Ryan have two beautiful children and live with Sammy, their Nova Scotia Duck Tolling Retriever. Dr. Leland grew up in Keller, TX (a suburb of Ft. Worth). She discovered veterinary medicine at a school fair when she was 6 years old and wanted to be a veterinarian ever since. She graduated from Texas A&M University with a Bachelors degree in Animal Science in 2011. She received her Doctor of Veterinary Medicine from Oklahoma State University in 2015. She came to join Village Veterinary Clinic after graduation and soon became a client favorite. Her goal is to continue growing as a veterinarian and learn to balance her family life and professional life. Katie and her husband, Hunter, have a beautiful daughter who has two guardian dogs, Penny and Miller, to protect her. Susanne was raised in Abilene, TX. She followed the family tradition by attending Texas A&M University. Getting a degree in Wildlife Biology did not open the doors she thought it would. She worked in retail for many years before finally finding her place in the veterinary field in 1990. She joined the Village Veterinary Clinic family in 2000 and said she instantly felt she was "home". She loves her VVC family, both coworkers and clients. Susanne lives with her three rescue dogs, Gideon, Gypsy and Piglet. Kate was born and raised right here in Houston. As a small kid, she was obsessed with everything to do with animals and the army. She graduated from Texas A&M University-Corpus Christi in 2004, with a major in Criminal Justice and a Minor in Social Work. Katie then moved back to Houston to start a short-lived career with the Houston Police Department. While attending HPD’s academy in 2005, she started dating and became engaged to her current husband, Ben. That changed a few life perspectives and priorities. Katie ultimately decided to resign from the HPD, shortly after graduating from their academy. A few months later, she began her career with us here at Village Veterinary Clinic. She has become a “Jack of All Trades” by working as a technician, receptionist, administrative assistant, and manager. Her title changes day-to-day, depending on the need. She and Ben live in Katy with their two daughters, Lucy and Cora, and their two dogs, Rudy and Turk. JoAnn grew up in a large family here in Houston and graduated from Memorial High School. She has wanted to work with animals since she was a teenager. She has been working in veterinary medicine for over 15 years. She loves helping pets because they love us unconditionally. Her ultimate goal is to go to Bible college and work in children's ministry or a recovery home. JoAnn and her husband, Carlos, live with her son Nicholas and their rescued Shih Tzu, Faze. Christina was raised in Sugar Land, She claims she wanted to work with animals since birth. She joined the Village Veterinary Clinic family in 2013 after graduating from Texas A&M with a double major in Biomedical Science and Bio-environmental Science. She quickly found she loved both the clinic and it's clients. There is no question that the feeling is mutual. Christina and her husband, Daniel, live with their dogs, Izzy and Axel... and a sweet cat nicknamed Lucifer. Kelly joined our family in 2016. With her big smile and cheerful demeanor, she was a terrific addition to our front desk. She was raised in Richmond, TX where she dreamed of working with animals as she cared for her MANY pets. Tara was raised in Los Fresnos, TX (South Texas). She has always loved animals. She received a B.S. in Interdisciplinary Studies at Texas A&M in 2007. She joined Village Veterinary Clinic in 2014 and was an instant hit with our clients. Tara lives with her Ragdoll cat, Finley and her dog, Aggie. Carissa was raised in Galena Park where she graduated from Galena Park High School. She graduated from the Vet Tech Institute in 2009. She loves all animals and has always wanted to work with them. She has a large animal family at home including Stubby and Duke (dachshunds), Layla (mix) and Xena (pitbull). She also owns many reptiles. Carissa is a new mother and her world now revolves around her handsome son. Carissa lives with her husband, Will and their son, Zarian. Ashley was raised in the Beaumont area where she worked in veterinary medicine. 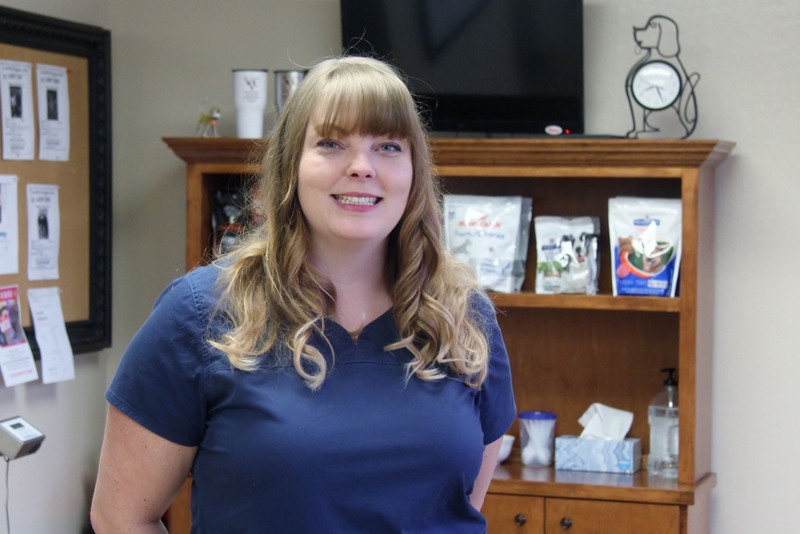 She moved to Houston and began working at Village Veterinary Clinic in 2015. She has always wanted to work with animals. She has a special place in her heart for the senior pets and poodles. She always keeps us entertained telling us humorous stories about her bad dates. She has been a terrific addition to our family. Ashley lives with Daphne, her miniature poodle. Evonne joined Village Veterinary Clinic in 2015. She worked in emergency medicine for several years before joining our family. Not only is she an excellent technician, she is often our entertainment. Her Louisiana humor always makes us laugh. Although exhausted most of the time, this new mother gives her all to our clients and their pets. Evonne lives with her husband, Melvin, her son, “Q” and her two dogs, Nala and Cane. 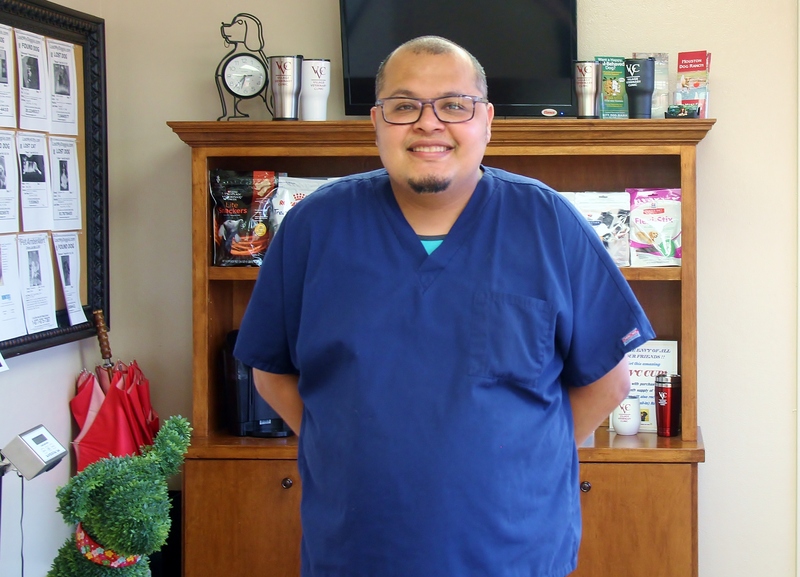 Jose joined the Village Vet family in the Spring of 2018. His love of pets and people was immediately obvious to everyone. Although he was raised in Lake Jackson, his passion for animals began as a young child while in Brazil "helping" his mother who worked in a wildlife sanctuary. Jose lives with his large menagerie of pets ranging from frogs to dogs! Jennifer joined Village Veterinary Clinic family in 2015 and immediately fit right in. Jennifer grew up in the Sugar Land area. She has wanted to work with animals as long as she can remember. She is always ready to lend a hand where needed. Jennifer and her wife, Blythe, live with their 5 cats and 2 dogs in Katy. Her goal is to retire anywhere near the water. Anyone who meets Max will first notice how gorgeous he is. Unfortunately, he knows it! Max is the king of this kingdom and we are only here to serve him.